So far, in this quilling for beginners series, we’ve tackled basic coils and curvy shapes, such as teardrops and marquise. Let’s now move on to another part of quilling: how to make paper squares and other angular shapes. 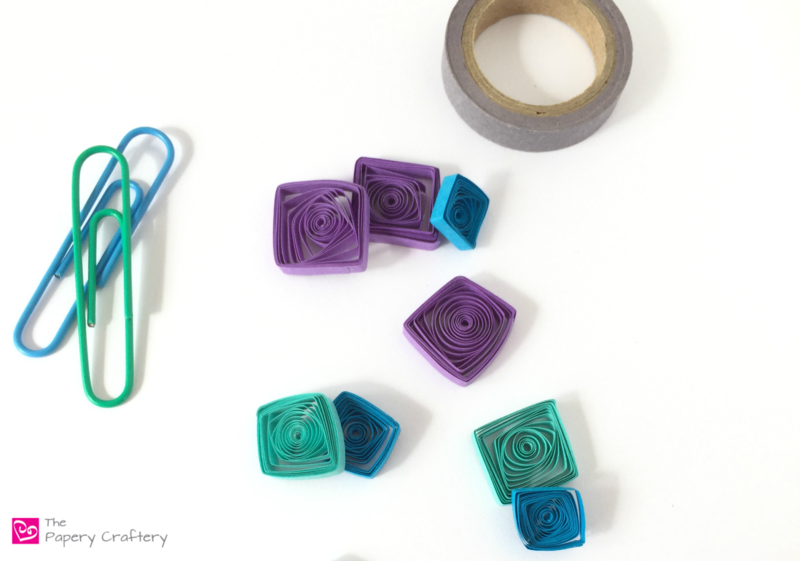 But first, grab your copy of my quilling paper shapes printable so you can follow along! Now, to be perfectly honest, these shapes are not something I use in my quilling work very often. I don’t have a real reason. I’ve just always been drawn to circles and swirls! Nevertheless, quilling paper squares are an important skill to master, especially if you’re looking to be a accredited member of an quilling organization, like the North American Quilling Guild. To start all the following shapes, you’ll first want to roll loose coils. A quilling paper square is formed by pinching either side of the coil in an even way. Rotate the pinched coil 90 degrees to pinch the other 2 sides, keeping an consistent space between all angles. Keep the shape as is and its a diamond. Or, spread the outer layers of paper out to create a square. To make a rectangle, simply adjust the spacing between the pinched sides so they are not so evenly spaced all around. A quilling paper triangle is created by pinching 3 sides of a coil. From a loose coil, gently squeeze one side, then spin and pinch in two more places. All types of triangles would be made the same way. Another common angular shape is the arrow. The arrow is similar to a triangle because it has 3 angles. Start with a strong squeeze on one side. Rotate 90 degrees and make 2 smaller pinches, close together, on the other side. Bend the end with the 2 close angles around your quilling tool to create the peaked effect. The angled marquise also starts with a deep squeeze on one end of a loose coil. Rotate and make a slightly gentler pinch on the opposite end. Next, spin your shape so the first 2 pinches are top and bottom. Using both hands at the same time, make 2 more small pinches on either side of the last angle. The last quilling paper shape for now is the bunny ear. A bunny ear is a loose coil with 2 small pinches next to each other on one end. I think this one looks more like a cat, but that might just be me. Slightly deeper squeezes are also traditional on the bunny ear. Note: there is a variation on the bunny ear called the lily of the valley. For this, bend the two peaks out away from the coil slightly. There are a few more obscure quilling shapes: maybe I’ll share them too one day. Keep an eye out for future posts on making paper scrolls and swirls! But, for now, keep on quilling! Thanks Emma! And I don’t have the patience for crochet, but I always wanted to learn! This is so creative! I never knew this was a thing… first time I’ve ever heard about it. I can’t wait to try! The only thing I’ve ever made with paper were paper flowers and garlands… and a few other things, but never this. Excited to try it out with my kids. That’s great, Karina! I’m glad to help you discover something new. And quilling is a great kids craft. Once you get the basics down, check out the rest of my tutorials to create flowers, simple bugs, fruit and all kinds of things! OMG I’ve never heard of quilling until now! I wish I knew about this growing up, back when I had all the time to craft. My fave quill here is the one shaped like a cat (last one)! Thanks Berniedette! If you ever find the time again, its a great, simple craft to learn! So neat! I always wonder how stuff like this is made–thanks for the tutorial! No problem, Cathy. I’m glad I could teach a little something!